"Never cut the ribbon until you have something to show off." It's election season in the Indian Union, and there's no hotter topic than clone rights. Are clones property, or are they people? Should they be granted full citizenship? As these questions rise to prominence and prompt Jinteki to scramble its PR teams for damage control, Akshara Sareen and her Ēkatā Party are riding the surging interest in clone rights to gain greater traction in the polls. 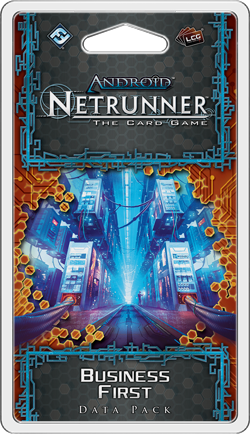 Business First, the second Data Pack in the Mumbad Cycle for Android: Netrunner, is now available at retailers throughout the United States. Availability in other regions may vary. 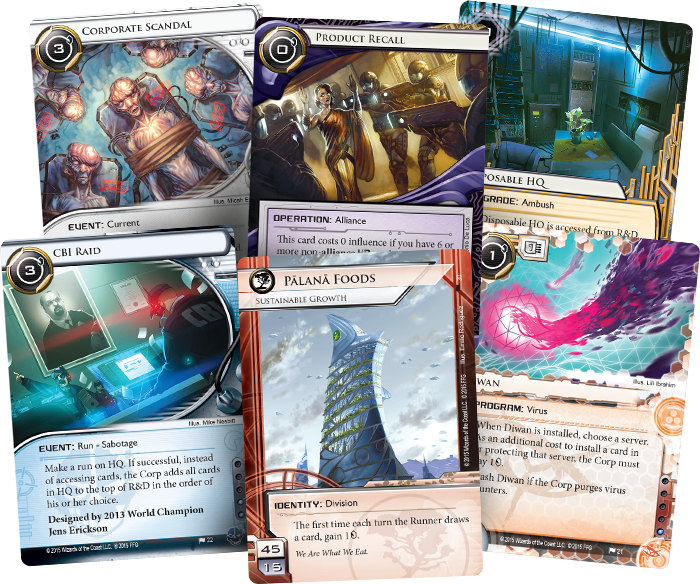 Many of the sixty cards from Business First (including a full playset of nineteen different cards) continue to develop the clone rights controversy that lies at the heart of the Mumbad Cycle and its politically influenced cyberstruggles. These cards line up on both sides. Runners use the controversy and Populist Rallies (Business First, 26) as leverage to weaken Jinteki's position. Meanwhile, the corps respond to the news as best suits their shareholders' interests. 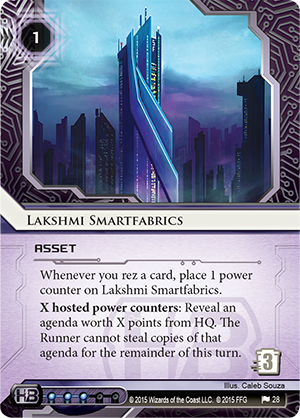 For example, Haas-Bioroid sees the negative attention turned toward Jinteki as a chance to promote itself as the healthier alternative, proudly displaying its Advanced Assembly Lines (Business First, 27) and the high standards of Lakshmi Smartfabrics (Business First, 28). Jinteki, on the other hand, looks to weather the storm by shifting a great deal of attention away from concerns about clone rights and clone treatment toward the advances being made at Pālanā Foods (Business First, 30). With a focus on sustainable growth, that division has partnered the company's leading work in biogenetics with new designs for agroplexes that are far more efficient than traditional farms. And in a time of political turbulence, each Pālanā Agroplex (Busines First, 31) radiates a spirit of progress and optimism—food for everyone!—that's an easy win-win marketing effort for Pālanā and Jinteki. Let the runners try to find the dark side of these innovations! They'll simply run themselves out of ammunition. 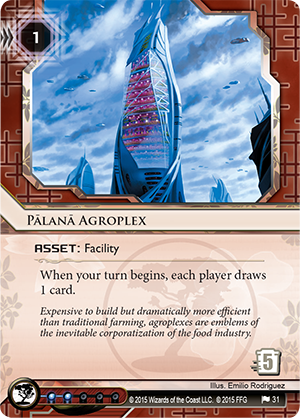 The worst that Pālanā has to offer is a Harvester (Business First, 32) that helps the division share its ample bounty with others… and that would certainly never possibly stand as the outward-facing defense of a server that gets its real protection from Komainu (Honor and Profit, 17). 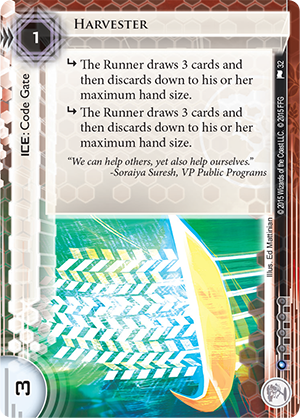 Jinteki's actions are to be expected, but what about the Weyland Consortium? How is it responding to the possible threat against many of its best and cheapest workers? 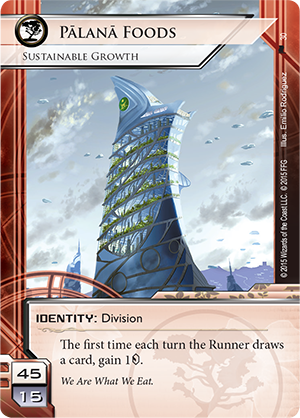 If one were to give credence to the urban legends about Weyland's typical retaliatory measures, one might suspect the corporation of coordinating the prompt purchase, destruction, and redevelopment of one of Mumbad's seedier neighborhoods—the sort where a runner might be expected to hide out. Or one might expect to find stoic, ex-military men prowling the streets in black suits and smartglasses. 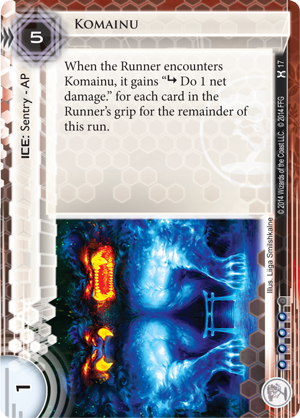 In fact, if one were inclined to give weight to such urban legends, one might be surprised that in Mumbad, Weyland appears to be very much on the up-and-up. What's to hide? Nothing. 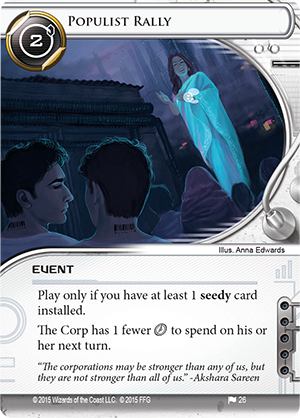 In Business First, the Weyland Consortium continues to operate with the "total transparency" that marked much of its efforts in the SanSan Cycle. 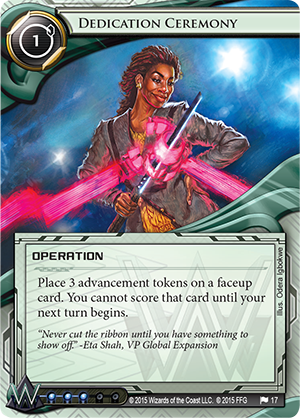 First, you have New Construction (Business First, 35), the fourth Weyland agenda that installs faceup. 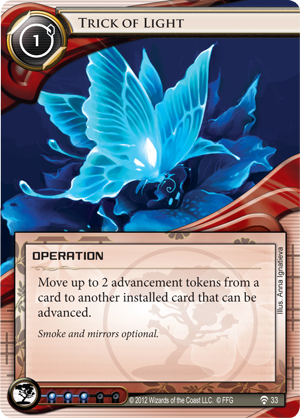 As with the other three, all of which were introduced in the SanSan Cycle, New Construction allows you to trade out your attempts at bluffing in favor of advantages that you gain each time you advance the agenda. 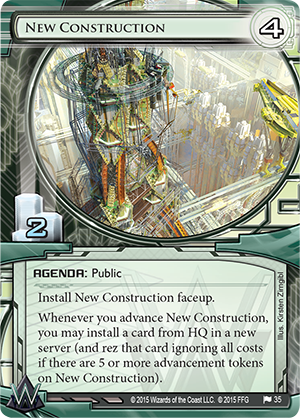 Specifically, each time you advance New Construction, you can install another card from HQ into a new server, and if you have five or more advancement tokens on New Construction you can rez the card it allows you to install for free. 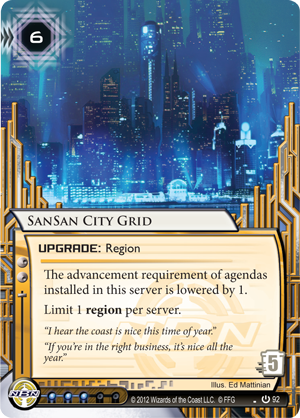 Yes, that slows you down initially, but how would you like a free SanSan City Grid (Core Set, 92) to help you score the other five agenda points you need to win? 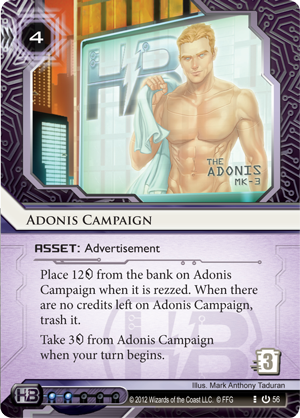 Or a free Adonis Campaign (Core Set, 56)? 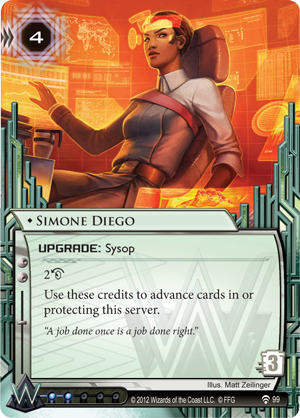 Or a free Simone Diego (Humanity's Shadow, 99)? Of course, the trick is to get as quickly as possible to the point where your advancement of the agenda is providing you maximum benefit. To that end, you could use Trick of Light (Trace Amount, 33) to move a couple of tokens from one of your ice. 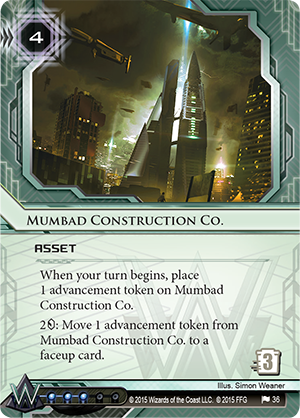 But you could also use Dedication Ceremony (Kala Ghoda, 17) or the new Mumbad Construction Co. (Business First, 36)—a new asset that gives Weyland its first real in-faction taste of the popular "fast advance" strategy. Urban legends are all well and good, but solid business is even better. 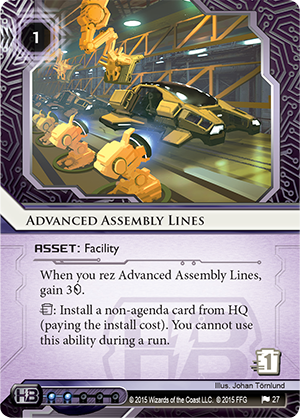 While the clone rights controversy has Jinteki and Haas-Bioroid racing ahead in panic mode, Weyland is quietly building its way toward a fortune. The Indian Union isn't just the world's largest democracy; it's also a major part of Weyland's plans for continued growth. What Does Mumbad Mean to You? For many, the Indian Union's national elections are all about differences in ideology. For others, those same elections represent little more than the means to gain or lose fortunes. Criminal hackers, android-producing megacorps, and businesses of all sorts—everyone's got something at stake in the elections. What do you want to come out of them? And what will you do to ensure the outcome matches your expectations? Dive deeper into the data beneath the elections. Business First is now available at retailers throughout the United States and online via our webstore!